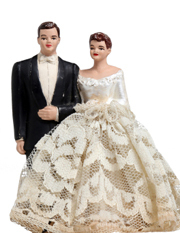 A 50th wedding anniversary cake topper will have pride of place in many photographs and there are lots to choose from. You could have a traditional '50th' in gold, these are available from most good cookery shops or you can get some fun couple cake toppers that would be unique to you, a mini bride and groom, or a couple gardening or relaxing by the pool. I have helped at a number of anniversary parties where the couple have organised a local baker to bake a copy of their original wedding cake, complete with the cake topper from 50 years ago. Most cake toppers are kept as a souvenir so it is quite likely that hiding somewhere in a box is the original. Fresh flowers work well as a cake topper or you could crystallise rose petals to place on the cake. All you need to do is brush the petals with egg white and then dip in caster sugar, leave to dry on some paper towel. It would look great with dark yellow petals on a white cake. You could also use silk flowers and these could then be kept as the souvenir from your 50th anniversary party. As well as fresh flowers you can also use sugar flowers, these you can buy already made which is a big saving on time and worry! If you want something unusual then think about hobbies; travel, cars, golf, cards, bowling, dancing, walking, have a look in toy shops and gift shops to find a miniature version and you have an instant cake topper. Make sure it is not too heavy as you don't want it sinking! For a very personal cake topper you could find a small gold picture frame and have a copy of your wedding photo on the top of the cake. It would be really fun if it was a photo of you cutting your original wedding cake! Here are some 50th cake toppers for you to look at for inspiration!